It’s the height of summer. And I am back in Canada for a month. There is a gentle warmness about the weather. And the days are long, so plenty of time to visit friends and enjoy the fresh, local produce that is always in abundance this time of year. Such a contrast to Cyprus this time of the year, with temperatures sometimes reaching 40C and the beach an oasis from city life. Both wonderful in their own ways. Since arriving in Canada, I have been slow to adjust. Maybe it is the jet lag, maybe it is not. But lazy summer days are on the agenda. It seemed like the perfect time to indulge in warm, fluffy pancakes for breakfast, but with something special. Carob Syrup. Pancakes with carob syrup are unlike normal pancakes. There is a sweetness about them, but it is not overdone. It’s more complex. 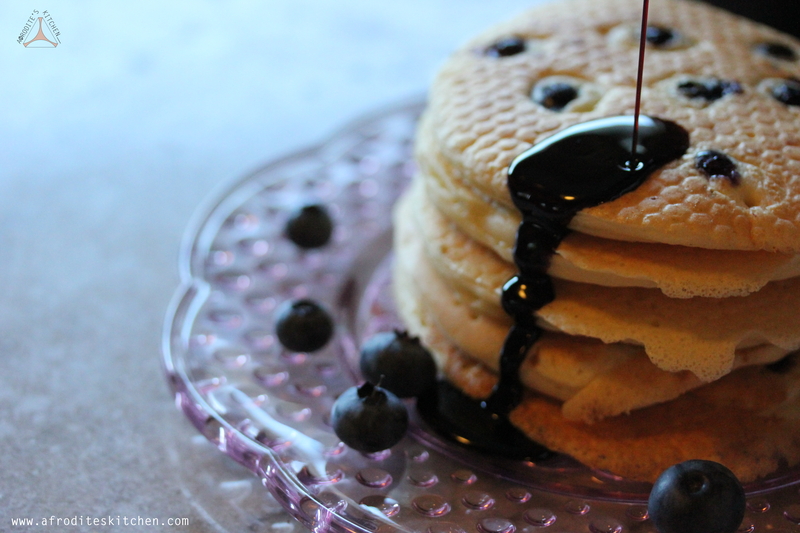 When we were young, we always wondered what this weird black syrup was that our mom would put on top of our pancakes. We just assumed that the maple syrup had ran out. But truth is, now, I actually PREFER carob syrup on top of pancakes to maple syrup. Carob syrup is a thick, dark syrup which reminds me a little of chocolate, a little of honey, and a little of maple syrup.Carob syrup is known as black gold in Cyprus because it is widely exported. Many grannies – mine included – used it as feed for livestock. Five year old me labeled it “donkey desert”. Carob syrup comes from grinding and boiling the long carob pods from carob trees. And, it is good for you too. (Yippy) According to various internet sources, one benefit is that it aids digestion. It helps regulate digestion as well as acts as a natural anti-allergic, antiseptic, and anti-bacterial agent. It also provides provides powerful anti-viral benefits that supply the body with essential antioxidants. This is especially beneficial for people who are suffering from diarrhea, as it reduces acid production and combats related ailments. 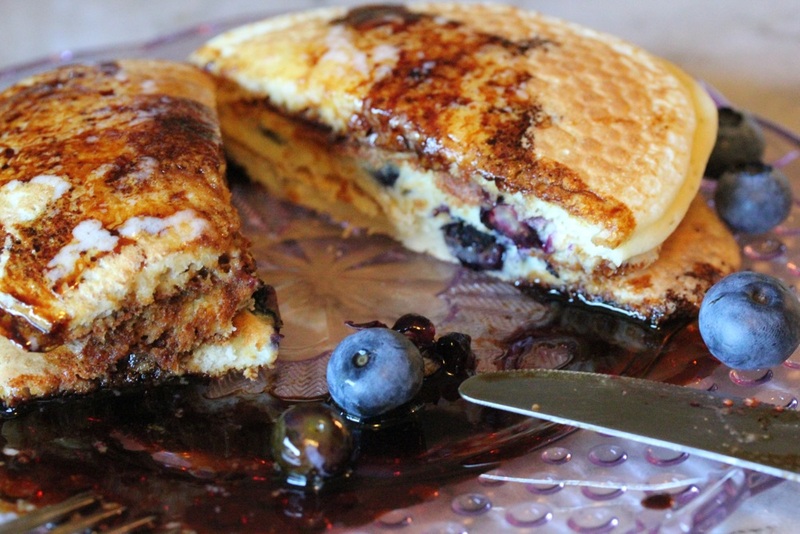 Needless to say, carob syrup can be used in a number of recipes, not just drizzled on top of pancakes! So I am looking for more ways to incorporate carob syrup into my cooking, and will be posting them in future. But for now, it’s breakfast time and I have a brunch date with my patio table, some carob syrup and a pile of pancakes. 1. Whisk the eggs with the milk until incorporated. 2. Add flour a little at a time. 5. Heat a frying pan on medium heat on stove. 6. Add a small ladle of batter to the pan and cook until bubbles form on top. Flip the pancake. 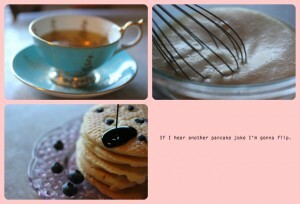 Pancakes should be light-golden brown. 7. Drizzle carob syrup and fresh blueberries to taste on top of pancakes and enjoy with a cup of coffee!